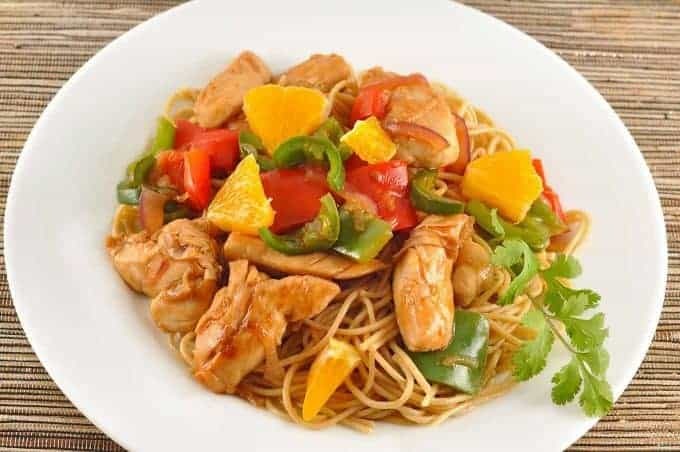 Fresh orange, spicy jalapeño, crisp bell peppers and a sweet, pungent sauce make this quick chicken stir fry a great choice for an easy dinner. 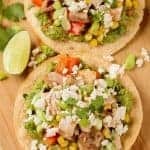 It’s versatile enough to be served over rice or noodles. 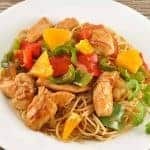 We like thin whole-wheat spaghetti because we feel its mild, nutty flavors make a nice complement, but white rice, brown rice, rice noodles, or even ramen would be just as tasty. 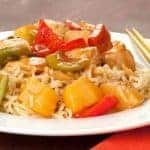 Made with quick-cooking chicken tenderloins and served over noodles or rice, this recipe is an easy take on sweet and sour chicken that includes a fresh orange and crisp bell peppers. Prepare the chicken by trimming away any white connective tissue. Cut each tenderloin in half lengthwise, then crosswise and place in a bowl. 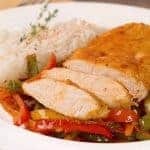 Mix the soy sauce, orange juice and cornstarch, pour over chicken and toss to coat. Let stand for 10-15 minutes. Mix the ketchup, orange juice and sriracha in a glass measure. Add the sugar and mix until dissolved. Set aside. Add oil to a pre-heated stir fry pan and add the red onion. Stir fry for 1 minute, add the garlic and continue cooking for another 30 seconds. Add the chicken and continue stir-frying until the chicken is almost cooked through, about 2 minutes. 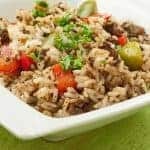 Add the jalapeños and bell pepper and continue cooking just until the bell pepper is crisp tender, about 2 minutes more. Add the sauce, stir to coat the chicken evenly and heat to bubbling. Season with freshly ground black pepper. Serve over noodles or rice.